Xiaomi Redmi Note 5 Review: New Budget King? Xiaomi Redmi Note 5 was launched on 14th February, 2018 in India. The mobile features 5.99” FHD + Full screen, that fits aesthetically into a frame, making it comfortably sit in your pocket. The 1080 x 1920 pixels screen, gives you an absorbing visual sensation while playing games, watching videos, scanning photographs and many more. The phone comes with 78% improvement in performance over its quad core predecessor. It is powered by an octa core Snapdragon 625 processor. With Adreno 506 GPU, you get up to 1.4times better graphics performance. It holds 3/4GB RAM and 32/64GB default storage, expandable up to 128GB via microSD card. The display features 178 degree in plane switching(IPS) technology, delivering stunning color consistency from every angle. The glass film film(GFF) architecture lets the pixels to sit closer to the glass, allowing colors to pop off the screen, which results in giving brighter images. The smartphone is equipped with a 13MP rear and 5MP front camera. A 28 millimeter wide angle lens lets you capture more with each shot. The f/2.2 aperture and 28mm wide angle lens let you focus on objects in the foreground of your shot, while softly blurring objects in the background. Connectivity aspects on board the Redmi Note 5 include wi fi 802.11 a/b/g/n/ac, dual band, wi fi direct, hotspot, v5.0, USB Type-C, with A-GPS. It comes with dual nano sim cards availability. It is fuelled by a 4000 mAh battery, allowing phone to be used for the complete two full days. It also provides a fast and safe charging experience. The smartphone runs Android 7.1.2(Nougat) based on MIUI 9.1, out of the box. It features fingerprint sensor(rear mounted) that works faster and in a secured way. Other sensors include light sensor, proximity sensor, accelerometer, compass and gyroscope. The unit is available in Olive Green, Black, Pink, Blue and Sky Blue colors in market. The Xiaomi Redmi Note is priced at Rs. 11,999/15,999 for 3/4GB and 32/64GB variants. 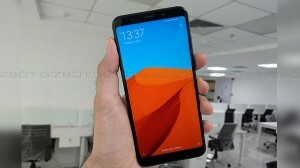 Xiaomi Redmi Note 5 Pro Android Pie based MIUI 10 Beta update released. The update brings along the April 2019 Android security patch. Android Pie-based MIUI 10 beta update coming soon for these Xiaomi smartphones. The Chinese tech giant is said to be working on the Android Pie beta testing update for the Redmi Note 5 Pro Redmi Note 6 Pro and the Redmi Y2/Redmi S2 smartphones.